B2B eCommerce has many benefits for any company looking to streamline their procedures, reduce costs and increase sales. The rise in popularity of purchasing online means that the doors are open for your business to the national or international marketplace. Your business needs to be online, where the customers are. Your B2B customers are also B2C customers of someone else, and they are used to the B2C experience. They expect functionality and UX that mimics Amazon and the like. Use this to your advantage and take tips from B2C, such as increasing order value by offering cross-sells or up-sells. B2B commerce traditionally happens through sales reps, catalogs and call centers. These routes to purchase are expensive compared with eCommerce. Providing a great experience to B2B customers online helps your business move away from spending time and money on processes that can be fully automated on an eCommerce site. The product information can still be extensive and accurate, with specification sheets, manuals, and diagrams being easy to view and download. When a B2C customer searches for something on an eCommerce site, they will usually see a combination of what they’ve searched for and what the business wants them to see. B2B customers, on the other hand, will need to see what they’ve searched for, but also what they usually buy. In B2B, customers are buyers, not shoppers; they’re much less likely to be browsing. They’re likely to be repeat buyers and want the quickest route to the products they’re looking for. They may even just want to click a button to reorder last week’s purchase. For this reason, personalization is key in the B2B domain. Using historical buying and browsing data, it is possible to create a personalized buying experience. B2B eCommerce can create a streamlined ordering process for customers who know exactly what they want. A B2B company may have hundreds of thousands or even millions of products that are typically complex with lots of attributes and variants. It is therefore vital that your B2B site search solution is able to cope with these complexities and shorten the path to purchase. We will explore how to use dynamic filters and advanced search capabilities to make sure that your customers can find what they’re looking for among the many products. We will also share how to make sure that your customers are only viewing products and prices that are relevant to them. Many organizations struggle with multiple versions and formats of catalog numbers resulting in failed searches and lost revenue. We will discuss how to ensure that however a user searches – they find the correct product. B2B buyers expect catalogs to be customized based on negotiated product assortments, warehouse locations, and pricing. The last thing that a customer wants to see on your site is products that are not available to them. Personalization can significantly affect B2B online revenue. Customized pricing is a challenge unique to B2B businesses. Prices are individualized based on factors such as contract, purchasing frequency, and volume. We will explore the ways in which complex B2B pricing can be handled in the context of search. B2B customers will experience your company through different channels – call centers, eCommerce site, sales representatives. All of these channels should have the same information and your business should be able to have a single view of all customer activity. With over 60% of B2B customer research happening on mobile devices, the ability to understand more verbose, natural language queries is paramount. There will always be B2B customers who simply want to reorder. A good eCommerce system allows you to maintain a list of regular order items and to use analytics to spot trends. Online B2B means that you have a closer view of customer activity, so that if there are any issues, or the customer simply hasn’t logged in for a while, you can make contact. If your company intends to do business outside of the U.S. there are implications in terms of language, currency, and regulations. The EU regulations may be different for your products, for example, product or product labeling may need to be modified. Using a search solution that intuitively understands multiple languages and currencies is imperative in the global market. Although some techniques are transferable from B2C commerce, often B2B companies have a specific buyer group, meaning that their initial customer contact will be made through channels such as trade shows or sales representatives. Once customers are aware of your business, however, they are likely to try to find your company online to continue their research. Good content and S.E.O. is therefore just as important as for B2C sellers. There are huge benefits in putting in place a strategy to drive B2B customers to your eCommerce site. But is your site capable of maintaining the relationship and even driving more revenue through excellent functionality? When asked to cite the top features or functions they would most like from suppliers in the selling process, most business buyers chose enhanced search functionality on their website (60%). 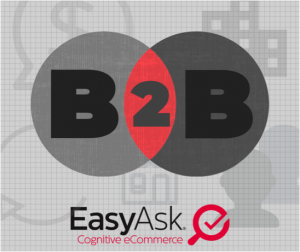 EasyAsk has long served the B2B customer segment and over 200 B2B distributors have chosen us to power their B2B eCommerce sites, including: Aramark, Alphabroder, Demco, Kaman Industries, Tacoma Screw, and Crown Packaging.